I stumbled across this East German PC while exploring Sergei Frolov's Soviet calculator collection last week. Manufactured in 1984, this utilitarian "Worker's PC" was based around a clone of the Zilog Z80 processor running at 2.5 MHz. It ran what seems to have been an iron curtain variant of the CP/M OS popular in the west until it was obliterated by the MS-DOS juggernaut in the mid 1980s. The display offered 16x24 or 28x80 green text, and I'm willing to bet it had no graphic or sound capabilities. 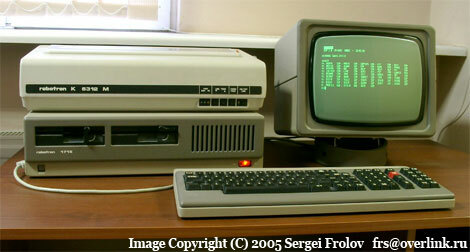 The machine was initially offered with 64 KB RAM, which was later upgraded to 256 KB. By far the coolest thing about the Robotron is its display, which looks so amazingly retro-cool that I'd love to have a row of them spewing dangerous bursts of radiation all over my desk so I could I valiantly fight off waves of nausea to whip off your daily dose of Retro news. Alas, this brilliantly odd machine was followed by the Robotron EC-1834, which was merely a boring beige IBM-PC clone running an "MS-DOS compatible" operating system. I doubt it was nearly as dangerous.